Shree Ganesha is the son of Goddess Parvati and God Shiva. The Rigveda considers him to be the chief of Ganas host of angels (Devas) , superb seer among seers. He is considered to be the Brahmanaspathi, a vedic divinity of highest order, sage among sages. As Brahmanaspathi he is personification of purity, piety and knowledge. He embodies the application of knowledge and intelligence to attain prosperity and pleasure. He leads the devotees through the path of knowledge and facilitates the progress of the devotee by removing the obstacles in his path. 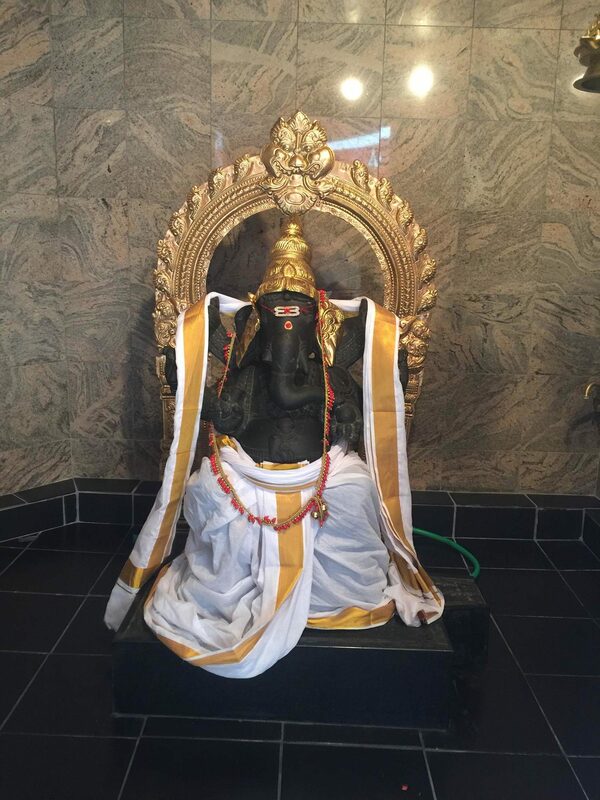 He is the first deity to be invoked, and worshipped before other pujas. Buddhi Pradaayaka: means the “Granter of Intellect, Perception, and Discernment”. MahaaGanapati: means the “Great Leader of the Group”, where the group is God Shiva’s attendants and followers. Sankatahaara: means the “Remover of Complications, Problems and Danger”. Siddhi Vinaayaka: means the “Guide to Accomplishment, Attainment, and Success”. Goddess Lakshmi is the consort of God Narayana also known as God Vishnu. Goddess Lakshmi embodies riches and wealth, splendor and beauty, and fame and fortune of God’s creation. God Vishnu embodies the all-pervading and multi-dimensional aspect of God. Naraayana means the journey of mankind leading to God or moksha (liberation from the cycle of birth and death). Vishnu preserves and protects the universe representing sattva-guna, the mode of goodness by which everything is sustained. He is believed to have appeared on earth in his avataras to save mankind. Rama and Krishna are two of those incarnations, upholding and setting examples of Dharma. Lord Satyanarayana is Lord Vishnu Himself, as the incarnation (avatara) of Truth. Goddess Lakshmi is the consort and shakti (or power/potency) of Lord Vishnu. The worship thus includes pujas for Lakshmi-Narayana, Satya Narayana, Rama, Krishna, Radha Krishna etc. Poornima SatyaNarayana Poojaa : Every lunar-month evening on Poornimaa Tithi (15th “lunar-day” or full-moon). Also on every New Year’s day. Rama Navami Poojaa : It is held in Hindu lunar month [Chaitra] (Mar.-Apr) . Krishna Janmaashtami Utsava : This event celebrates with festivities the anniversary of the birth or appearance of Shree Krishna. Vaikuntha Ekaadashi Pooja : This event observes the opening of the doors to [Vaikuntha].It is observed on the 11th “lunar-day” of the “bright-lunar-half” of Hindu solar month [Dhanusha] (Dec.-Jan.). Lord Shiva is described in Srimad-Bhagavatam (4.2.2) as the spiritual master of the entire world. Shiva Linga is the embodiment of the positive and negative forces of nature and universe which enable regeneration. It represents the duality without which the “wheel” of life, nature, and universe would stop moving. Shiva’s drum represents Srishti, the creation, the abhaya hand (giving blessings) represents sthiti, or preservation, his foot that presses down symbolizes torobhava, or the veiling effect, and the uplifted foot means blessings, anugraha, especially towards seeing through the veil of illusion caused by ego. Shiva is also known as BholeNaatha which means kind and giving, easily pleased and forgiving, understanding and non-judgmental, and simple and straight. 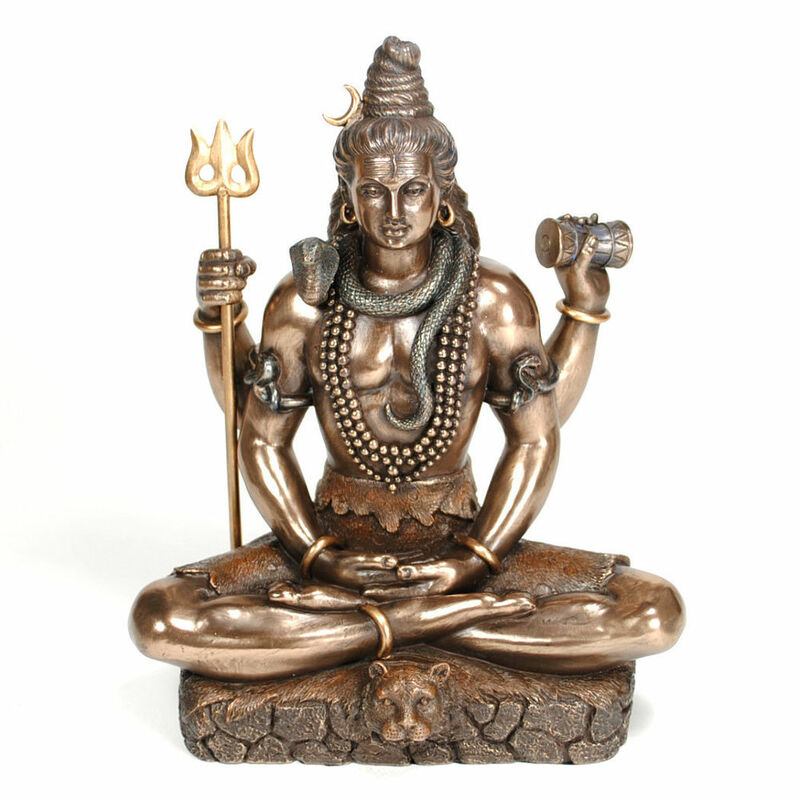 The Rudra form of Shiva is worshipped for the destruction of terrible things. Though Rudra is a violent form, He is benevolent. MahaaShivaraatri Shiva Poojaa : Is held in Hindu lunar month [Maagha] ([Phaalguna]) (Jan.-Feb.). Shreenathji is the form of Lord Shree Krishna who provided protection to all (man, animals, etc.) During a violent storm and unrelenting rains Shreenathji lifted the Govardhana Parvata (Govardhan Hill) on his little finger and kept that pose until Lord [Indra] (Lord of Rains and Weather) relented and surrendered. The hill is in Mathura, near Vrindavan Town, in India. From this great act, Shree Krishna got the names like Giridhaari (mountain-bearer), ShreeNaathaji (glorious savior respectfully), etc. In appreciation and joy, two “thanksgiving” traditions began namely Govardhana Poojaa and the grand Annakoota Utsava. Annual Pooja: Govardhana Poojaa and the grand event Annakoota Utsava on the day after Diwaalee (Oct.-Nov.). Radhe Shyam together are the embodiment of eternal affection, attraction, love, and union of God’s creation with God. Humans seek to understand and dissolve into God and Radhe Shyam provide the knowledge and understanding which helps to achieve this. Swami Narayan is a modern sect of Hinduism or Vaishnavism in particular which began with a person named Ghanshyam Pande believed to be an incarnation of Lord Narayana. Swami refers to Ghanshyam as the Lord and Narayan refers to God [Vishnu] as Lord [Narayan] meaning the journey of mankind leading to God or [moksha]. Navagrahas are the embodiment of the nine most influential gravitational forces in addition to Earth’s gravity upon all materials, gross bodies, and life-forms. Nava means nine, [graha] contextually means gravitational force, and “gravity” means powerful force of attraction. The Navagrahas are, Soorya (Sun), Chandra (Earth’s moon), Bhauma or Mangala or Kuja (planet Mars), Budha (planet Mercury), Brishaspati or Guru (planet Jupiter), Shukra (planet Venus), Shani (planet Saturn), Raahu (ascending node of Earth’s moon), and Ketu (descending node of Earth’s moon). The Moon has three gravitational forces. They are the normal Moon called [Chandra], Moon at the ascending node called Raahu, and Moon at the descending node called Ketu. Note that this is a simplified explanation for brevity. Weekly abhishekam on Saturday mornings. Naga Parivar at our temple consists of Naageshwara (Lord of Reptiles/Serpents/Snakes), Naagaraanee (Queen of …), and Naagakanyaa (female, young, and virgin child of …). Nagas are in constant service of and seen with many deities which also symbolizes that the deity is completely unaffected by and in absolute control of rajasika influences. Rajasika refers to the state of matter or materials in which they are considered destructive, fiery, intense, and violent. Hence, people suffering from conditions and diseases due to raajasika causes often pray to Nageshwara, Nagaraanee, or Nagakanyaa for removal of the causes. Prospective brides pray to Nagakanyaa and couples to Naagaraanee for procreation and marriage of their offspring. According to Puraanas, Naga Pooja bestows upon devotees good health, wealth, happiness, and long life. Annual Pooja : Grand event Naaga Panchamee (Jul.-Aug.) and Naaga Chaturthi (Oct.-Nov.) with Abhishekam, Alankaaram, and Poojaa. Goddess Sarasvati is the embodiment of creativity, harmony, knowledge, and mastery of sound. She grants artistic talent, discerning ability, learning ability, and powers of speech. Her blessings are sought before the start of any academic, artistic, poetic, speaking, and writing endeavor. Annual Pooja: Sarasvati Pooja during Devi Navaraatri. Shree Durga embodies the total energy and power of God’s creation and is the ultimate mother. She is the unification and culmination of the energies of Shiva, Vishnu, and Brahma. These are, respectively, Maha Kali, MahaaLakshmee, and Maha Sarasvati. Hence, creating, sustaining, healing, and destructing are all in Her domain. She provides Her devotees fulfillment of desires, visionary intellect, removal of afflictions, diseases, poverty, and fears, refuge and protection to such seekers, etc. She also provides Her devotees the capability to provide aid, help, refuge, and protection to others. Annual Pooja: Nine-day grand event Devi Navaratri (nine nights of [Devee]) culminating with Vijaya Dashami (lit. conquest tenth) on the tenth day (Sep.-Oct.). Shree Ram Parivar ( Rama’s family) consists of Shree Hanumaan, Lakshmana, Sita, and Shree Rama. Shree Hanumana is the ultimate sevaka (servant) who provided service to Shree Ram selflessly, without question and fail, and for the full benefit of Shree Ram. He embodies discipline, humility, selflessness, and surrender to God. He is an excellent role model for children. Lakshmana is the ultimate “brother-in-arms” who dedicated his life for service and support of his elder brother Shree Ram. He embodies bravery, devotion, determination, and steadfastness in achieving a goal. He is an excellent role model for a younger brother together with younger brother Bharata. Sita is the ultimate wife who always remains true to her husband in every way in all situations of life including when in foreign and hostile places in the absence of her husband and amongst all sorts of danger and temptations. She embodies absolute faith, loyalty, sincerity, and trust. She is an excellent role model for all women especially wives and keepers of families. Shree Ram is the ultimate son of a family, eldest brother of siblings, disciple of a master, husband of a wife, and king of a nation. He embodies altruism and benevolence, fairness and justice, forgiveness and fearlessness, piety and righteousness, and much more. Hence called Maryaadaa Purushottama Prabhu Shree Rama. Maryaadaa means observing the boundaries of life like conduct, morality, piety, propriety, custom, tradition, rule, law, etc. Purushottama means the best and most excellent of men. Prabhu means the most excellent king, leader, protector, savior, etc. Shree means the most glorious, magnificent, respectful, successful, etc. Shree Rama is an excellent role model for any man, in any relationship, in any profession, in any location, and in any situation. No wonder He is revered across the length and breadth of Asia all the way down to Indonesia and now the world over. The famous books called Ramayana (journey of Ram) chronicle the life of Shree Ram and has been written and poeticized by more than one person. Mahavir literally means the “great hero” and is the common name referring to sage Vardhamaana who reformed Jainism. However, Mahavir did not propound a religion and instead established and propagated a simple yet effective path to moksha or nirvaana which means liberation from the cycle of birth and death. Followers of Jainism take five major vows to help them achieve nirvaana. These are ahimsaa (not harming), satya (honesty), asteya (not stealing), brahmacarya (chastity), and aparigraha (renunciation). Annual Poojaa: Mahavir Jayanti (jubilee of Mahaaveera) which practically means the observance and celebration of the birth anniversary of Mahavir (Mar.-Apr.). Bal Subramanyam is the boy form of Lord Skanda or Kartikeya, the Supreme General, God of War, and the son of Shiva and Parvatei. He embodies perfection, bravery, and valor.Lord Skanda is known by many names. Common names are Kartikeya, Kumaara, Murugan, Shanmukha, and Subramanya. Buddha means the “awakened and enlightened with true knowledge” and is the common name for the spiritually awakened, enlightened, and realized Gautama Buddha previously Siddhaartha Gautama. Though the religion called Buddhism is said to be started by Him, however, Buddha did not propound a religion and instead established and propagated a path to moksha or nirvana which means liberation from the cycle of birth and death. The temple observes the annual event Buddha Jayantee. Dharma Shasta is the son of God Shiva or Hara and the Mohinee form of God Vishnu or Hari. Hence, He is also called HariHaraPutra (son of Hari and Hara). Another common name is Lord Ayyappaa who is believed to be the incarnation of Lord DharmaShaastaa and over the passage of time both have become synonymous. DharmaShaastaa killed a demoness called Mahishee who acquired a boon from God Brahmaa to be killed only by the son from the union of Hari and Hara, an act she thought impossible. This very boon necessitated the union of Hari and Hara in order to maintain and protect dharma (duty, morality, piety, righteousness, virtue, etc. ).